There is something equally captivating and unique in the Gnawa music tradition. Due to the use of polyrhythmic tonalities, rhythmic sintir (guimbri) melodies, call-and-response singing, hand clapping and cymbals called krakeb (plural of karkaba), Gnawa musicians create hypnotic and repetitive sessions that can’t be find somewhere else, in any other music genres or styles. Easily recognizable for its original structure and patterns, and very hard to be assimilated by musicians from the international sphere, this music has found itself an own place, history and status in the complex universe of music from all over the world. In Moroccan popular culture, Gnawas, through their rituals, are considered to be experts in the magical treatment of scorpion stings and psychic disorders. They heal diseases by the use of colors, condensed cultural imagery, perfumes and fright. The center for Gnawa music is Essaouira in the south of Morocco, where the Gnaoua World Music Festival is held annually for many years. The name Gnawa had originated in the indigenous language of North Africa and the Sahara Desert - the Berber language or Tamazight. This is deeply hypnotic trance music. In most cases, as well as in the case of Maalem Mahmoud Gania, this is considered healing music, evoking ancestral saints who can drive out evil, cure psychological harms or cure scorpion bites. 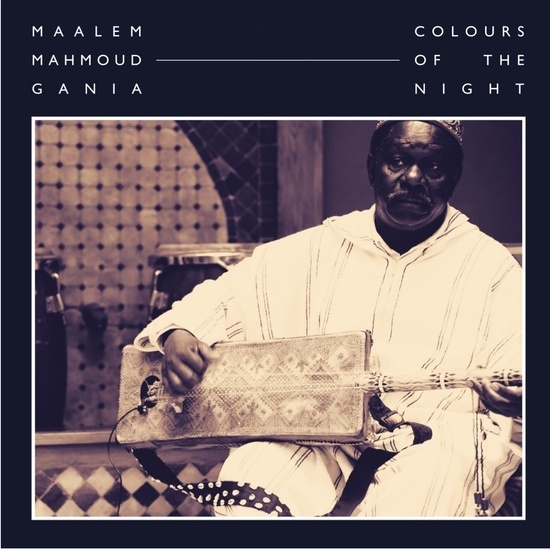 This album of Maalem Mahmoud Gania is very important in many ways. Besides the music itself, it is a document which opens elusive gates to new audiences, especially Western ones. It is the first release outside of Morocco and comprises the final studio recordings of the great Mahmoud Gania. From the 1970s until his death in 2015, Maalem Mahmoud Gania released many albums for a variety of local labels including Tichkaphone, La Voix El Maaraf and Sonya Disques, as well as recording with Western musicians such as Pharoah Sanders (for the collaborative album Trance of Seven Colours), Peter Brotzmann and Hamid Drake at Wels's 1996 Music Unlimited festival., and most recently James Holden and Floating Points. Comprising 8 sublime, simply beautiful, heavy trance-like songs recorded in 2013 at Plein Les Oreilles studios in Casablanca, the anthology Colours of the Night released in September 2017 by the London based imprint Hive Mind Records transports the listener into a magical land, a beautifully crafted landscape by the master Mahmoud Gania. After Mahmoud Gania passed away on August 2015, his sons continue the Gnawa tradition both being Maâllem of the Saouiri style, notably Maallem Houssam Guinia.